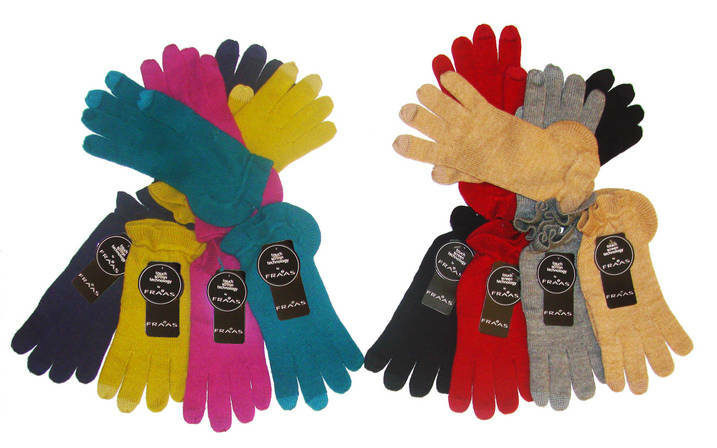 The ABCD Diaries: Holiday Gift Idea: FRAAS Touch Screen Compatible Gloves! Holiday Gift Idea: FRAAS Touch Screen Compatible Gloves! "The rising interest in chic cold weather accessories is evident everywhere. Fashion-savvy women are wrapped in great looking scarves and accenting their look with interesting hats and smart gloves. FRAAS is on target with a versatile collection of options for Fall-Winter 2012. Technology has entered the fashion accessories scene with TOUCH SCREEN COMPATIBLE GLOVES. FRAAS offers 3 chic options--retailing for about $30--a long scrunch, a ruffle, and a bow--22 options total in all the colors. These are not something to be missed as a self or gift purchase. Anyone with a touch screen device will want a few pair! Those without a device will appreciate the attractive styling and affordable pricing plus one size fits all for buying ease. Style 060579 is one of these three looks and is extremely popular thanks to its feminine ruffled hem. It is an Acrylic/Cotton/Poly/Metallic blend and is available in grey, blue-grape, black, rose, chartreuse, camel, teal and dark red. Keeping with cutting-edge design, FRAAS introduces these gloves with tech finger tips that are so well-matched to the glove, they are almost invisible. This offers a stylish and more lady-like approach for the tech-savvy customer." What we thought: These gloves are adorable! Very stylish and chic and cute to boot:) Plus, they work great! I tried wearing them and using my touch screen phone and my Kindle and they worked perfectly on both. These are fantastic because unlike other gloves where you must pull back the tip to use some devices, your fingers can stay toasty warm while texting or using other touch screen devices. They would make a great gift this holiday season! ABCD Diaries gives these gloves an A+!